This product is excellent quality for the price. It was very easy to put together and the detail of the picture is very good. My daughter has had great fun driving her cars around on it. It's also very easy to clean and store. Create a dedicated learning area for your youngest pupils that also offers protection with our Foam Play Mat Tiles Road 9pc. Made from a high-quality and cushioning foam, this 9 piece set features individual jigsaw like pieces with bright and colourful detailing. Fitting together in a wide range of different compositions, this mat lies securely on any hard and flat surface to create a soft and inviting place to play. The intricate road and city design features hospitals and police stations and is a great way to encourage imaginative play and leads your pupils on to perusing careers in field such as architecture and engineering. This play mat is great padded addition to your toy or play section. 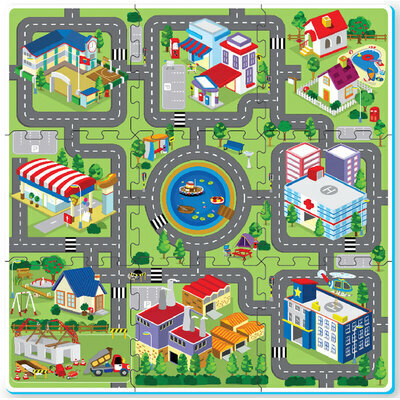 Our Foam Play Mats also come in a Road design for creating miniature villages within your class room. If you're looking for other products to add intrigue and excitement to your room, consider everything from our Wooden Block Set 100 Pcs through to our Tuff Spot Sand Tray Blue 940mm - all at exceptional wholesale prices.